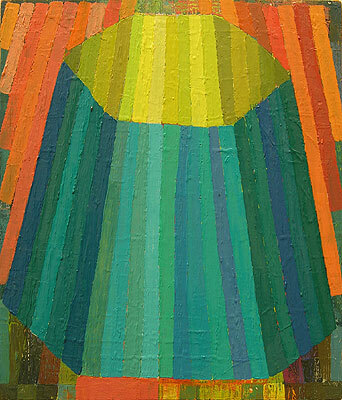 At McKenzie Fine Art through March 10: Jason Karolak. Above: Untitled (P-1004), 2010, oil on linen, 14 x 12 inches. Karolak has two types of paintings in the show, big ones with brightly colored geometric wire-like frames floating on black backgrounds and charming small ones like the densely painted beauty pictured above. So many ways to interpret this one – what a great piece! Thanks for sharing!